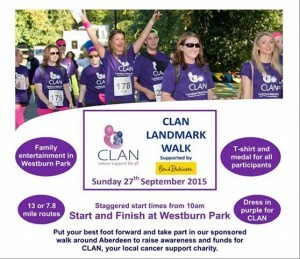 PETREX DEVELOPMENTS SIGN UP FOR CHARITY WALK-SUPPORTING CLAN FOR THE THIRD YEAR. An enjoyable Sunday Walk around some of Aberdeen Cities Landmarks which are very often taken for granted. The last two years the weather has been great, fingers crossed for this year.